Body is chocolate brown with a white belly and gray and white head and neck. Gets its name from the distinctive tuft of hair see on the top of its head. The tuft is darker in color than the rest of its body and is blackish brown. 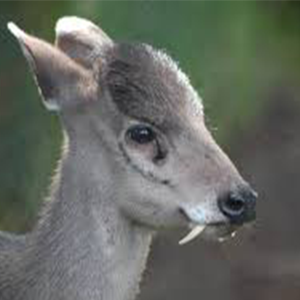 Coats are short and dense with spiky hairs, giving the tufted deer a shaggy appearance. Young are colored like adults with an additional row of white spots along each side of the spine. Bucks are known to fight over a territory and mates using their canines and antlers. Tufted deer are shy during the day and become more active at night.